What is the White Calling Card? The White Calling Card is a service that allows you to make international calls at very low rates by dialling an access number first. How do I use the White Calling Card? For calls outside the UK dial 00 + country code + area code + number. For calls within the UK always dial the area code e.g. 020, 01273 etc. Where can I buy a White Calling Card? Alternatively you can purchase your White Calling Card and top-up vouchers which are available from many retail outlets throughout the UK. How do I top-up my white Calling Card? You can top-up your White Calling Card online by clicking here. Which access number is the best for me? We provide you with various options to access our services through different access numbers. This allows the user to determine which number is best for them to make the most cost effective call. Below is a summary of the various White Calling and standard access numbers and most frequently used call types for the respective numbers. – All calls made to 0800 access number will be subject to a one off answer charge of 0.35p per call. This charge is effective from 2nd November 2016 and based on new charges brought in by BT Telecom. Please note: White Calling Card do not take responsibility for any charges incurred for dialling any of the access numbers. Please check with your service provider for these charges. Where can I find my PIN numbers? When you purchase and/or top-up a PIN on this site, it will be listed under “My PINs” in your account. An email will also be sent to you with the PIN on. If you have a recharge card, your PIN will be listed on the back of the card. If you still cannot find your PINs, please call us on 0330 001 0488 for help. Are there any daily maintenance charges? At White Calling Card we have no monthly or daily fees, no contract to sign and no credit checks! Why am I unable to dial a number? While no operator can offer 100% guaranteed service due to reliance on other telephony companies, we have a team working 24hr/day 365 days a year ensuring quality checks are in place to help avoid poor quality lines and give you the best possible call experience. However, if you do happen to experience a poor connection, please call Customer Services on 0330 001 0488 and let us know the number you are trying to call. For all White Calling cards, credit expires 180 days after the time the voucher was last used. To change any of your account details, simply log in to “My White”, hover over “My Account” and select the option you need from the drop-down menu. You will receive email confirmation of any changes made to your account. To contact the White Calling Card customer service team call 0330 001 0488. Our customer service lines are open from 9am – 6pm, 365 days a year. 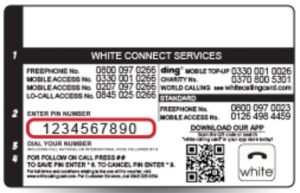 White Connect offers a range of products and services that can be purchased using your White Calling credit. You can share your White Connect account with your friends and family worldwide so they can benefit too! Why not lend a helping hand to some very deserving charities by either making a one-off donation or giving your left over credit? – Lebone House, a holistic care centre for children infected/affected by the HIV/AIDS epidemic, opened in Bloemfontein, South Africa in May 2000. Learn how you can make a difference by donating just a small amount of your White Calling credit.